What is the Gothic? A genre, a style, a movement, a subculture? The Gothic is all of this, and so much more; it is one of the most enduring and fertile artistic traditions in the history of modern civilization. Since the publication of The Castle of Otranto by Horace Walpole in December 1764, the Gothic has constantly rejuvenated and reinvented itself, taking on new forms while remaining true to its aesthetic principles. From old castles to futuristic cities, from corrupt priests to urban predators, from medieval poetry to modern rock, the Gothic evolved over the centuries, transforming the popular culture in the process. Like Frankenstein’s creature, the Gothic is alive and one can feel its beating heart in every art form and media. This guide provides an overview covering all facets of the Gothic culture, from its philosophical basis to its practical applications in literature, comics, cinema and television, music, games, digital art, and fashion. 5.0 out of 5 starsThe Definitive Book on The Gothic! Excellent!! 5-STARS!!! Blakemont does a fantastic job of summarizing centuries of Gothic works into this concise and highly informative book. Blakemont covers the entire spectrum of Gothic; from literature, film, music, art, to even political and or social issues of individuals who openly identify themselves as "Goths." While there are many books out there on the subject of "The Gothic," I have yet to read any that feature as much vision, informed research and are as current as this superlative Gothic "encyclopedia." Highest Recommendation! I was given a copy of this book in exchange for an honest review. My basic policy on being ‘honest’ is: 4 stars = I liked it a lot but am trying to appear discerning. If there was anything that bugged me but I still liked it = 3 stars. If I disliked it, I won’t post a review, unless the author is famous and already has hundreds of reviews. So, adhering to my aforementioned policy, I was going to give this book 4 stars. But then I thought, why? I genuinely loved this book. It was an unusual read for me because I only read fiction, with the exception of artist biographies. But I was immediately intrigued with Blakemont’s book because Gothic is a subject close to my heart. I like dark settings, darker characters, intrigue, angst…obsession. 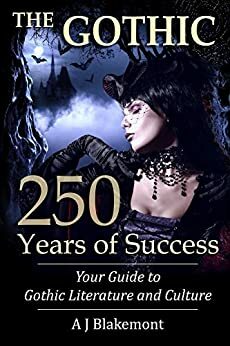 In a straightforward and engaging way, this book will tell you how the Gothic genre has evolved and, more importantly, how it has survived for 250 years. If you are a fan of Gothic, whether it is in literature, film, music or fashion, give this book a read. I found myself enlightened and thoroughly entertained. Though the writing is somewhat academic, it moves quickly and has an underlying sense of fun. For example, check out the tips on Gothic fashion. This guide tells us about Gothic art rfom its origins to the present day. The author analyzed the expression of the Gothic style in all art forms. There is a lot of information in this book, but fortunately the writing style is easily understandable and engaging. This work will be helpful to anyone studying literature or other arts.